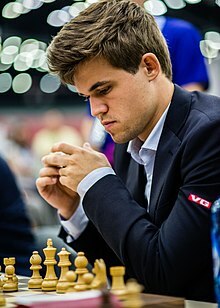 Sven Magnus Øen Carlsen (Norwegian: [sʋɛn mɑŋnʉs øːn kɑːɭsn̩]; born 30 November 1990) is a Norse chess grandmaster an umwhile chess prodigy who is the No. 1 ranked player in the warld. His peak ratin is 2872, the heichest in history. Carlsen wis the 2009 Warld Blitz chess champion. On 26 Aprile 2004, Carlsen acame a grandmaster at the age o 13 years, 148 days, makin him at that time the seicont youngest grandmaster in history, altho he haes syne acome the third youngest. On the November 2009 FIDE ratin leet, Carlsen haed an Elo ratin o 2801, acomin the fift player tae achieve a ratin ower 2800. Aged 18 years, 336 days at the time, he wis bi far the youngest tae dae so. On 1 Januar 2010, at the age o 19 years, 32 days, he acame the youngest chess player in history tae be rankit warld No. 1, breakin the record held bi Vladimir Kramnik. On the Januar 2013 FIDE ratin leet, Carlsen reached an Elo ratin o 2861, thus surpassin Garry Kasparov's ratin record o 2851 set in Julie 1999. Based on several o his FIDE rankins, Carlsen qualified for the Candidates Toornament that teuk place in Mairch–Aprile 2013, which he wan, thus earnin the richt tae challenge Warld Champion Viswanathan Anand in the Warld Chess Championship 2013. Kent for his attackin style as a teenager, Carlsen later developed intae a mair universal player. He daes nae focus on openin preparation as much as ither tap players, an plays a variety o openins, makin it hairder for opponents tae prepare against him. His poseetional mastery an endgemme prowess hae drawn comparisons tae those o umwhile warld champions Anatoly Karpov, José Capablanca an Vasily Smyslov. Ayond chess, Carlsen haes modelled for G-Star Raw's Autumn/Winter 2010 advertisin campaign. This page wis last eeditit on 2 Dizember 2017, at 07:30.